Mid-Life Cruising!!! : New Marina, Future Home? After checking out the new Slidell fishing pier Saturday morning, Ken and I decided to drive about two minutes further to check out the new Lake Shore Marina in Slidell that we'd been hearing about. 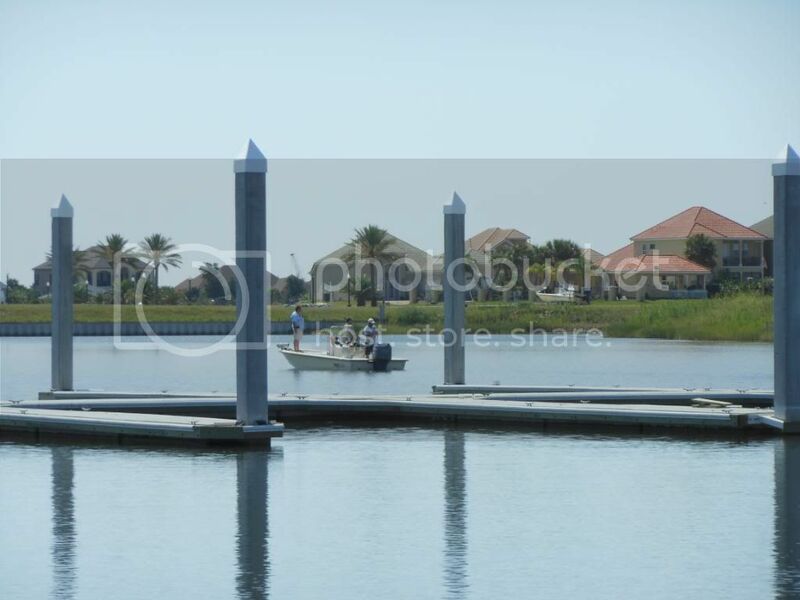 This marina is right across the interstate from our subdivision, and therefore just minutes away from our house. We drove to the construction site, and were glad to see that we could walk around. 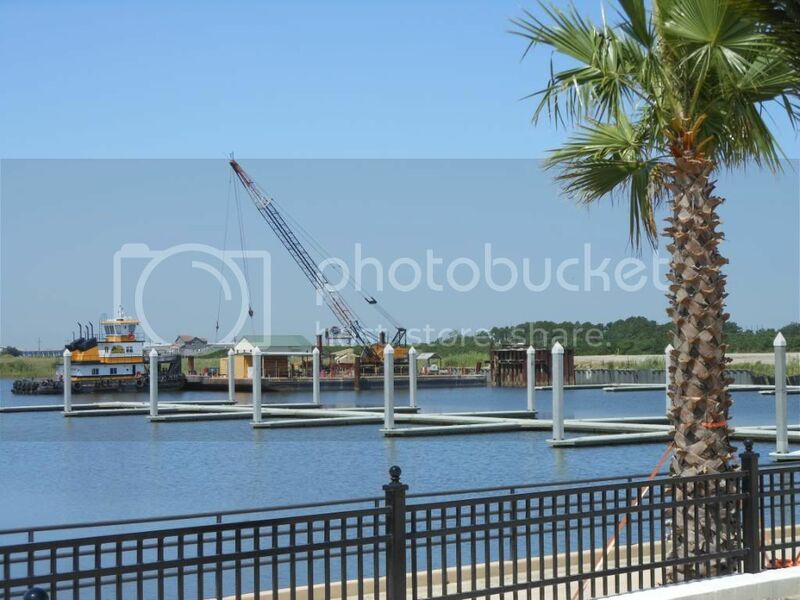 We were really excited to see the new marina, with its palm trees, iron fencing and floating docks. This marina is located in a very upscale area (we're on the other side .. LOL) and we imagined how nice this facility is going to be once it's finished. We don't know the real figures yet, but we've been told that the marina is going to be very reasonable ... we hope so! 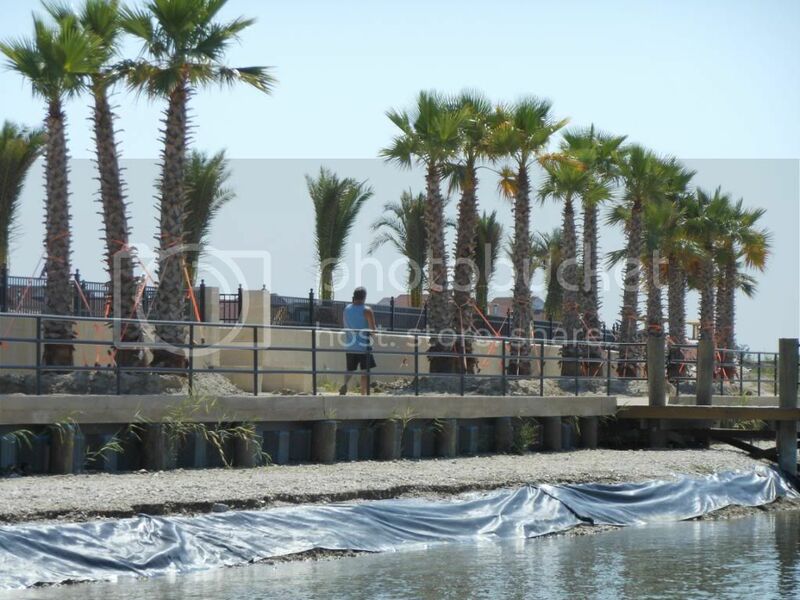 The marina was expected to be finished by now, but it still has some work to be done before it's open. However, it should be complete by the time we sell our home. This would be a great place to live on Nirvana while making our final cruising preparations! I wonder if they're going to have a pool?! Ken strolling along the new walkway ... I love all the palm trees! 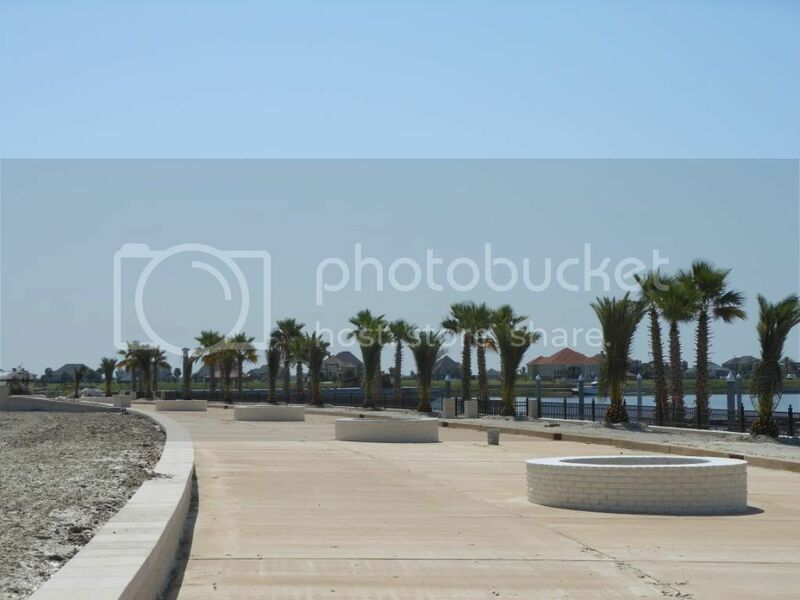 Really nice area ... we guess these round structures are planters for more palms! As I mentioned on our Facebook page ... Ken is finally able to start working on our house! We have waited a long time to get to this point, as we've had a lot of obstacles get in our way during the past year or two. I'm keeping my fingers crossed that the next 5-6 weeks go well, and that we'll have a "For Sale" sign in our front yard soon. 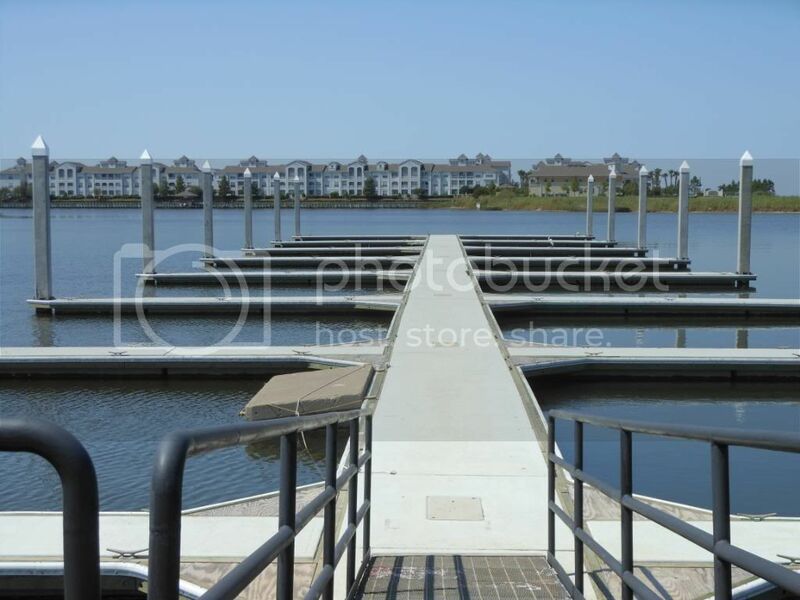 Seeing this marina really gets us anxious to get our house on the market! Wow it's such a beautiful marina. So peaceful! Nothing better than a nice marina, except having a boat in that nice marina. You're getting closer. That's a beautiful marina. Sigh. The idea of a marina with a pool... that would mean that the weather would allow such things as pools...I can only dream of that one, for sure. Hope it's as reasonable as they say and you get a space. It sounds idea and looks lovely. Thanks for visiting our blog. We added you to our blogroll and are looking for other blogs of people in the same position so we can add theirs too. Now got to find you on facebook. Looks like a lovely marina! One thing to be aware of (you probably are, but just in case) is that not all marinas allow live-aboards, so it is something to inquire about. Some allow them on a short-term basis, or if you're friends with the dockmaster and he can tell you're not low-lifes. :) Our marina didn't technically allow live-aboards, but there was one man who'd been living there for years and others who lived there for a period of months. It was really up to the dockmaster's discretion. Good luck with your house fix up and hope this marina will work out for you! Emily, good point about whether or not they allow liveaboards. We've wondered the same thing and don't know the official answer just yet. We've been told that liveaboards will be allowed, but it's just heresay so we're keeping our fingers crossed.